I added Oreo Cupcakes to 2 polls already, but poll after poll, they didn’t win. I bought a bag of mini-oreos on sale and I decided to give the Oreo Cupcakes a try. It’s been a while since I did a fun design on a cupcake and I thought today would be a good day to do it again! The cupcakes themselves are chocolate cupcakes. 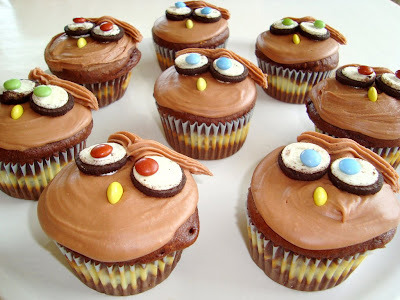 You can use any chocolate cupcake recipe you like. I used Nigella Lawson’s Sour Cream Chocolate Cake (which is my favorite chocolate cake recipe) and converted it into cupcakes. 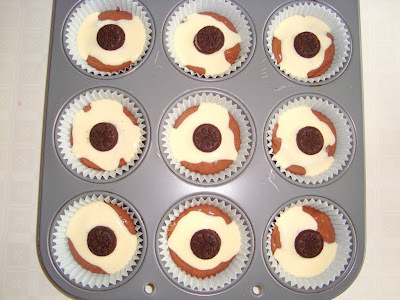 The cupcakes have a cream cheese filling and a mini-oreo inside them. The cream cheese looks fantastic from the outside, but you can hardly taste it. You can taste the mini-oreo, but next time I might add two or three mini-oreos. Rating 5 out of 5. Sour Cream Chocolate Cake recipe: Click here. Halve this recipe to convert it into cupcakes. Make sure you only make the cake recipe, not the frosting. - Prepare cake batter; set aside. Mix cream cheese, egg and sugar until well blended. - Spoon cake batter into each of 24 paper- or foil-lined medium muffin cups, filling each cup about half full. Top each with about ½ tablespoon of the cream cheese mixture and 1 cookie. Cover evenly with remaining cake batter. - Bake 22 to 25 minutes or until toothpick inserted in center comes out clean. Remove from pans to wire racks. Cool completely. There may be an indentation in top of cupcake after baking. 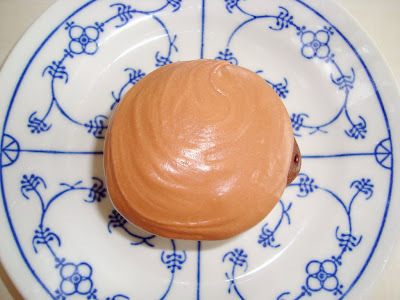 Real Chocolate Frosting recipe: my own! - Put the chopped chocolate in a dubble boiler over simmering water and let it melt. - Sift the confectioners' sugar and the vanilla and milk. Do not mix it yet. - Add the melted chocolate and mix with an electric mixer on medium speed 1 to 2 minutes until well combined. Add more milk if needed. Use immediately. 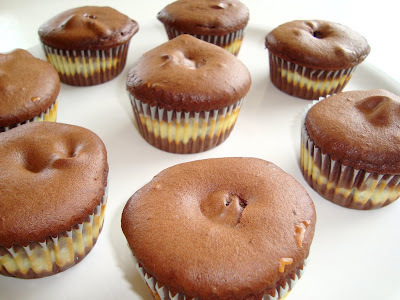 ½ tablespoon cream cheese filling over the chocolate batter. Topped with a mini oreo. Right out of the oven. 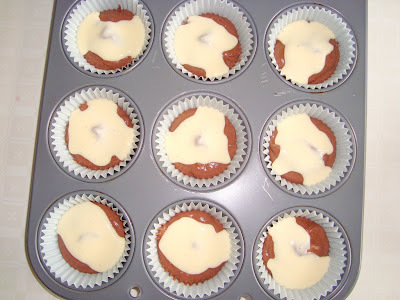 I think it's really cool how the cream cheese mixture shows through the sides of the cupcake liners. Too bad you can't taste the cream cheese. 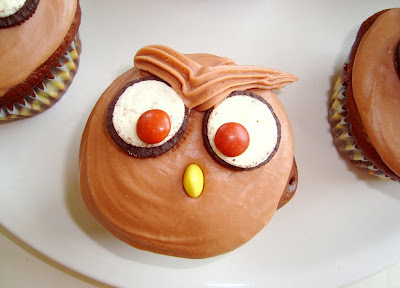 To create an owl cupcake, you frost your cupcake with chocolate icing. Swirl evenly with the back of a teaspoon. 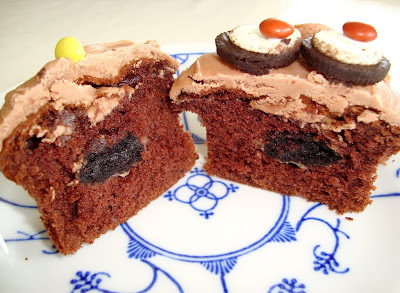 Use another type of frosting to 'glue' the oreos and m&m's (I used mini-Smarties). 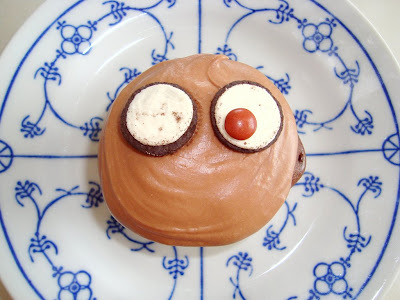 For the nose; press the side of a mini-m&m into the center of the cupcake. 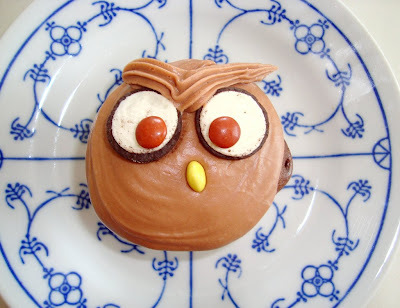 For the eyebrows; pipe a V-shape above the eyes with a frosting bag. The anatomy of an owl oreo cupcake. Pretty inside and out! whoa I love love LOVE it! going to try this. Bookemarked already. amazing how the word *oreo* didn't trigger more votes! how did you know i bought mini oreos and printed a sour cream chocolate cake recipe yesterday!? that's so funny. the owls are so imaginative! These are the cutest things I have seen in a really long time. You are incredibly talented!!! Wow! 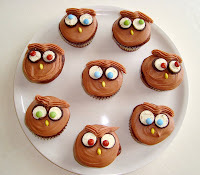 I adore these cupcakes, and the flavour sounds devine! My grandma has collected owls ever since I can remember, so whenever I see them I instantly think of her. I would love to make a batch of these darlings for her one day! Thanks sharing and for the inspiration! Love the blog! You're a great baker. I have the same experience as apparentlyjessy, my grandmom collected owls too. She would've loved these!